*Closed end lease financing available through 5/02/19 on approved credit to highly qualified Tier 1+ customers through Toyota Financial Services. Offer applicable to vehicles with a model number of 6262a only. See example stock number 238482 with corresponding VIN number (last 6 digits) of 513999 as reference for cars that qualify for this offer. 3 cars total available at this price. Includes $375 dealer discount and $1255 subventive lease rebate. Monthly lease payment based on MSRP of $18470. Net price after discounts is $18095. No security deposit required. Excludes tax, title, license, options, and dealer fees. Amount due at signing includes first month’s payment, capitalized cost reduction, and acquisition fee. Your payment will vary based on final negotiated price. At lease end, lessee responsible for disposition fee and 15 cents/mile over 12,000 miles and excessive wear and use. See your dealer for details. *Closed end lease financing available through 5/02/19 on approved credit to highly qualified Tier 1+ customers through Toyota Financial Services. Offer applicable to vehicles with a model number of 4430a only. See example stock number t238356 with corresponding VIN number (last 6 digits) of 006945 as reference for cars that qualify for this offer. 3 cars total available at this price. Includes $1356 dealer discount. Monthly lease payment based on MSRP of $27527. Net price after discounts is $26171. No security deposit required. Excludes tax, title, license, options, and dealer fees. Amount due at signing includes first month’s payment, capitalized cost reduction, and acquisition fee. Your payment will vary based on final negotiated price. At lease end, lessee responsible for disposition fee and 15 cents/mile over 12,000 miles and excessive wear and use. See your dealer for details. *Closed end lease financing available through 5/02/19 on approved credit to highly qualified Tier 1+ customers through Toyota Financial Services. Offer applicable to vehicles with a model number of 7162a only. See example stock number 237039 with corresponding VIN number (last 6 digits) of 117982 as reference for cars that qualify for this offer. 3 cars total available at this price. Includes $1279 dealer discount. Monthly lease payment based on MSRP of $27212. Net price after discounts is $25933. No security deposit required. Excludes tax, title, license, options, and dealer fees. Amount due at signing includes first month’s payment, capitalized cost reduction, and acquisition fee. Your payment will vary based on final negotiated price. At lease end, lessee responsible for disposition fee and 15 cents/mile over 12,000 miles and excessive wear and use. See your dealer for details. *Closed end lease financing available through 5/02/19 on approved credit to highly qualified Tier 1+ customers through Toyota Financial Services. Offer applicable to vehicles with a model number of 2532a only. See example stock number 238526 with corresponding VIN number (last 6 digits) of 734752 as reference for cars that qualify for this offer. 4 cars total available at this price. Includes $10707 dealer discount and $250 TFS lease subventive cash. Monthly lease payment based on MSRP of $25613. Net price after discounts is $23906. No security deposit required. Excludes tax, title, license, options, and dealer fees. Amount due at signing includes first month’s payment, capitalized cost reduction, and acquisition fee. Your payment will vary based on final negotiated price. At lease end, lessee responsible for disposition fee and 15 cents/mile over 12,000 miles and excessive wear and use. See your dealer for details. 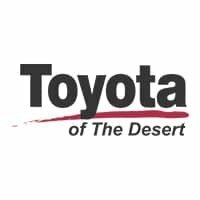 *Closed end lease financing available through 5/02/19 on approved credit to highly qualified Tier 1+ customers through Toyota Financial Services. Offer applicable to vehicles with a model number of 1852a only. See example stock number 238745 with corresponding VIN number (last 6 digits) of 006067 as reference for cars that qualify for this offer. 3 cars total available at this price. Includes $1190 dealer discount. Monthly lease payment based on MSRP of $21208. Net price after discounts is $20018. No security deposit required. Excludes tax, title, license, options, and dealer fees. Amount due at signing includes first month’s payment, capitalized cost reduction, and acquisition fee. Your payment will vary based on final negotiated price. At lease end, lessee responsible for disposition fee and 15 cents/mile over 12,000 miles and excessive wear and use. See your dealer for details.